Can’t complain about free, but I can make fun of it. Cody and I were going to get a new car. We looked at new cars. We test drove, we compared, we fell in love, we decided (Toyota Camry Hybrid, black with leather moonroof smart key heated seats and ooh uhmm mmm). And then we ran into all the crap that deals with loans and law school and limits and blah blah have I mentioned graduate school blows? So it’s in the shop with a two thousand dollar quote. BUT! When repairs total over $250 at this particular shop you get a loaner car while they fix your busted up car. Sweet right? Neon? Okay, if you have to. But apparently Bruce figured me a sassy (albeit impractical) kind of gal. 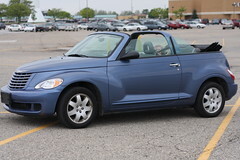 So he hooked the moosh and me up with a two door convertible. Uh huh, that’s right. See how the top is down and the sky is kind of gloomy? Like it’s about to rain? Yeah, that’s because it was gloomy and about to rain. And kind of cold. And yet we were the ones driving down the road with the top down because I was the one stupid enough to show the moosh that the damn roof came off in the first place. But the moosh is in love, she believes this car to be the reincarnation of AWESOME. And this is how I became the dork driving a bright blue car down the road in 58 degree weather with looming rain clouds, the roof open and a small curly headed banshee shrieking with joy in the backseat. But at least it’s amazing. And hilarious. Well, she does look awfully happy! Awesome pics! That kid is too adorable for her own good! I hope she enjoys the ride… and doesn’t make you too miserable in the process! and good luck with the “junker”! Lurve. And oh so freezy. The look on the moosh’s face cracks me up every. time. So awesome. The Moosh knows exactly how to act in a convertible. All adults should take note! you are soooo funny. i love those photos. memories foreva !!! feener’s last blog post..Giveaways !! Anything that makes them shriek with joy is so worth it. Your little Moosh is just too cute, and she looks super happy with the new (loaner) ride. 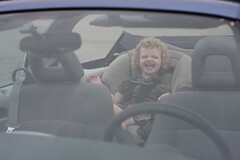 I’ve driven a loaner PT before, and it is tricky getting a car seat in and out of the car. I’m with Moosh. Riding with the top down is the best! That’s why you’re the best mommy! calicobebop’s last blog post..Oh Wait! Did I mention drama? Ok. That is just too stinkin’ cute! Looks like the weather might just be a bit warmer/sunnier today, so that riding that way might not be too bad. I would have done the exact same thing. You got a convertible so you HAVE to drive with the top down. That last photo is fabulous. If IN is anything like MI, the weather will change in 10 minutes anyway — and at some point during the repair, there will invariably be sun and warmth enough to put you in convertible heaven (though you may have to get her up during her nap to take advantage of those seven precious minutes). Have fun! top-down driving is de rigueur, my dear. moosh obviously knows from whence she shrieks! She looks like she’s on cloud 9. Just adorable! Freakin adorable! I do anything for happy banshee shrieks. That’s the exact car we had on our honeymoon in Hawaii. It was far more appropriate then. OMG She is going to SOB when you have to give that car back!! 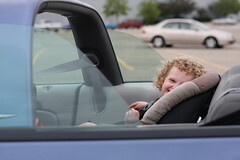 The Moosh knows that ALL the cool kids drive convertibles! 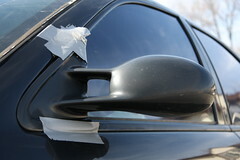 You’re going to have to cut the top off the clunker when you return this one. she makes the best faces ever. My kids would so do the exact same thing. I feel for you–our weather may be warmer but the humidity means you’d have to change clothes by the time you got to where you’re driving. Oh, I feel for you Casey! Our car just hit 221,000 miles this evening. I swear, the Moosh is happier than Ben Affleck and Jennifer Garner’s kid. Who’s smiling ALL the time. mommypie’s last blog post..Home. As Seen Through MP’s Eyes. perfection. i would’ve done the same thing. Pgoodness’s last blog post..Bugs, anyone? You have just assisted your child in developing expensive tastes. Hope Cody is a millionare when he becomes a lawyer! Too bad all those cars don’t come equipped with a cute little Moosh! that is priceless. really. makes me want a convertible. not a toddler. i have been through 4 of those already! i’ve never had a convertible. Rhea’s last blog post..The longest post in the day of my life. Very cool!! Hey, for a free loaner, I’d take one of those, too!! Man, that kid looks happy. I would say a convertible is destiny for her.